We’d love your help. 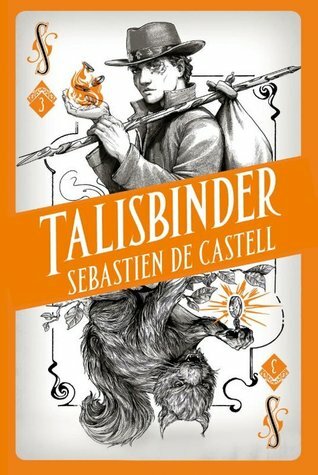 Let us know what’s wrong with this preview of Talisbinder by Sebastien de Castell. Het avontuur van Kellen gaat verder in het derde deel van de Spellslinger-serie! Zijn leven als een vogelvrijverklaarde is er niet beter op geworden nu hij achterna gezeten wordt door magiërs en premiejagers. Sterker nog, het wordt alleen maar erger… In Gitabrië, het land van de wonderbaarlijke constructies, heeft de uitvinding van een bijzondere mechanische vogel spionnen Het avontuur van Kellen gaat verder in het derde deel van de Spellslinger-serie! Zijn leven als een vogelvrijverklaarde is er niet beter op geworden nu hij achterna gezeten wordt door magiërs en premiejagers. Sterker nog, het wordt alleen maar erger… In Gitabrië, het land van de wonderbaarlijke constructies, heeft de uitvinding van een bijzondere mechanische vogel spionnen van het hele continent aangetrokken, die zouden moorden om de vogel in handen te krijgen. To ask other readers questions about Talisbinder, please sign up. Will there be a sequel to this book and will Kellen go back to the school? Sebastien Castell I do, indeed, have two cats. Both were feral rescues as kittens, and they still try to remind us of all their youthful hardships despite the fact that…moreI do, indeed, have two cats. Both were feral rescues as kittens, and they still try to remind us of all their youthful hardships despite the fact that they've lived in pretty much total luxury since then. Some of their behaviour definitely makes its way into Reichis's antics, though they have yet to actually try and consume one of my eyeballs. Once more, we join our protagonists the exiled mage Kellen, his Argosi mentor Ferius, and the unhinged squirrel cat Reichis on a road trip to their next destination in this third installment of the Spellslinger series. Building upon the events of the first two books, Charmcaster takes us out of the desert and into the land of Gitabria, where our characters are hoping to track down and help the first of many victims targeted by a Jan’Tep conspiracy. However, being a wanted man himself, Kellen finds his every step dogged by mercenaries. But then in a twist of fate, his latest confrontation with a group of bounty hunters leads him to rescue another mage on the run, who turns out to be none other Nephenia, an old friend (and secret crush) from his life before exile. After a brief recuperation, our characters continue to make their way to the capital, where they get the chance to witness the unveiling of a miraculous new invention. While most of the crowd is blown away by the spectacle, only a few, including Ferius, are aware of the threat this could spell for the entire world if this technology were to fall into the wrong hands. Unfortunately, it appears that dangerous factions have already caught wind of the groundbreaking innovations happening in Gitabria, for the inventor’s daughter turns out to be one of their targets. After experiencing first-hand the devastating results of his enemies’ methods in the last book, Kellen is determined to do whatever it takes to free the girl from their evil influence. Following the trend established by Shadowblack, we are introduced to a new setting, new cultures, and new side characters in this next chapter of Kellen’s journey. That said, the format feels very episodic in that each volume features a self-contained adventure, but together they make up an overarching series plot. As such, it is still imperative to start from the beginning and read the books in order. That said, I am starting to notice a few repetitive patterns in the storytelling. The introduction paralleled the opening chapters in the previous book, which begins with an attack that our heroes barely manage to thwart and ends with them getting a new addition to their party, but for some reason I felt it took things in Charmcaster a lot longer to take off. On the bright side though, I did delight in seeing Nephenia again, despite her character being much changed from the girl Kellen used to know. A significant part of this book deals with the fallout of what has happened back home while our protagonist has been on the run, and some of this involves why Nephenia has become so different. In fact, I would say the strength of this novel is in the character and relationship building, because although we see the overall plot moving forward, it’s admittedly not by much. Still, I am enjoying myself. Like its two predecessors, Charmcaster is fun, lively, and…well, charming. Sebastien de Castell continues to expand his world-building, adding even more detail and intrigue to this already rich setting. In Gitabria, our characters encounter a new land with different culture, politics, and traditions. They meet new people who teach them—and us—new things. Case in point, one of my favorite encounters in this book allowed both Kellen and the reader a glimpse into Ferius’ mysterious past, revealing that she too was a very different person in her youth. And of course, Reichis was his usual crass self, delivering most of the comic relief. As for Kellen, there were several interesting developments for his character too, mainly focusing on the deteriorating effects of the shadowblack and what this means for his mental capacities and how others treat him. In addition, Kellen is forced to face the harsh truth about his family and come to terms with the fact they are not the people he once thought they were. Needless to say, this book sees our protagonist growing up fast, whether he likes it or not. But therein lies the beauty of this series. Kellen began this whole thing as a naïve and sheltered boy of fifteen, but gradually he is becoming a man. Every adventure is a learning experience for him, and with each book, the lessons are getting harder. Compared to the first two books, I felt that Charmcaster was slightly darker in tone, presenting Kellen with problems that are more complicated and disturbing. Still, our protagonist has retained the essence of who he is, the goodness that allows him to make the right decisions, and for that I am grateful to the author. I won a copy of this book through Readers First. Starting six months after the ending of the previous book, Shadowblack (which you really need to have read). Charmcaster finds Kellen, Reichis and Ferius traversing a desert on their way to Gitabria. However, as is often the case for Kellen and crew things aren’t going according to plan and they are running from a mage induced lightning storm. After stopping to stand and fight, the mage who they initially thought was hunting them continues on past the trio, unaware and uncaring. It turns out that the mage isn’t hunting them but is being hunted themselves and is running from a group of Berabesq Faithful (religious zealots). Doing the right thing, the trio go and attempt to rescue the mage but in the ensuing battle, Ferius is badly injured. After holing up in a Traveller’s Saloon on the Gitabrian border to allow Ferius’s injuries to be treated, yes, to the Argosi booze and gambling are wondrous medicines. After a while, the intrepid trio, now accompanied by the rescued mage and their familiar, at the behest of an Argosi discordance card depicting a small mechanical bird leave the saloon and resume their journey finding themselves once again heading towards Gitabria and its Capital, Cazaran for the Grand Exhibition. The image on the discordance card, the small, lifelike, magical and innocuous mechanical bird is the highlight of the aforementioned Gitabrian Grand Exhibition wowing everyone in attendance. But, its invention also has disastrous consequences as the representatives from the other nations all vying to purchase the bird. Something so beautiful and innocent could, in the wrong hands (if they are able to unlock the secrets behind its creation) be turned into something ugly and as the discordance cards suggest used to start a war. Kellen (an outlaw spellslinger), Ferius, (an Argosi wanderer) and Reichis (Kellen’s talking ‘though only Kellen can understand him’ squirrel cat companion/business partner) are at the core of the tale told in Charmcaster but the rest of the characters we meet (both the good and the bad, some of whom you’ll like, some you’ll dislike, some old and some new) each have their roles to play and all add to the overall story too. One such character has a familiar with them, a Hyena named Ishak. This leads to some absolutely fantastic exchanges between Reichis and Ishak and their respective business partners especially as Reichis being Reichis (an oh so funny but oh so bad influence) leads Ishak astray. Reichis adds the humour to Charmcaster, he is a fabulous creation who steals every page that he appears on (obviously, not literally) a murderous and thieving squirrel cat with a bad attitude (for reference think Rocket from Guardians of the Galaxy) who likes baths, butter biscuits, eyeballs and murdering! Ferius is her usual often mysterious and obtuse self (we do get a deeper look at her) while Kellen continues to show development and growth. For Kellen, as the main character (though I’m reluctant to ignore Reichis and Ferius in that statement as I feel that they too deserve equal billing as main characters as they really are a tremendous trio who all contribute so much to the series and in Charmcaster itself, all three are given the opportunity to shine) he still has a tendency to both make mistakes and be naive at times. But, in the capable hands of de Castell he has come on leaps and bounds, now owning up to and learning from his errors, realising that actions have consequences (not just for himself but for others too) and maturing due to the various hardships that he has suffered and adventures he has endured. The Argosi are a mysterious people akin to wanderers. We know a bit about them and the various paths that they travel from the previous books but not much. However, with Charmcaster, de Castell, for me, pulls back the veil and just like with Ferius gives us a deeper look at the Argosi and their ways. We also get some glimpses at the wider picture and the motivations of the various other nations. The world continues to grow too with Charmcaster predominantly taking place in another new setting and culture. Cazaran, the capital city of Gitabria comes to life on the pages. The city is split in two by a massive gorge with eight bridges ‘The Cazaran Arches‘ spanning the gorge and connecting the two parts of the capital. The Gitabrians are a nation of inventors who craft and create a plethora of wondrous inventions. De Castell’s adult fantasy series, The Greatcoats is one of my favourite fantasy series and with Spellslinger, his YA fantasy series he has another winner on his hands too. Generally speaking, I’m not a YA reader and prefer the darker and grittier grimdark style of fantasy over the YA style. However, I’m a huge fan of the Spellslinger series and I feel that whilst labelled as YA, for me, it definitely bridges the divide between YA and adult and that readers of both will be huge fans of the Spellslinger series. If you’ve read anything by de Castell before then you’ll know what to expect from him and his work. He consistently delivers and his books feature emotion, humour, banter between characters that comes right out the top-drawer, fabulous characters, high-quality world-building and a damn good story full of twists and turns that is written with gusto and Charmcaster is no exception continuing his trend of delivering captivating, fun-filled and adventurous reads. Začátek byl úplně peckovní a Reichis je pořád topka. Čekala jsem, že mě ty jeho kecy o pojídání očních bulv a trhání uší už přestanou bavit, ale ne. Celkově to nebylo úplně epické, ale příběh je fajn – akce, nové postavy a tajemství. Kellen se dost posunul, líbí se mi jak postupně přidává nové triky a začíná být celkem badass, i když často tak trochu omylem. Je tu humor, zápletky, antihrdina co vyhrává spíš náhodou... a kočkoveverčák! Deset důvodů, proč vám tehle série nesmí uniknout, najdete tady. Sebastien de Castell did it again. I flew through this. It only took me 3 sessions of a couple hours at a time. A perfect way to spend a couple of days off. The series gets better edition to editiom and holds no punches. This is by far the best work in this series. I absolutely loved it and Sebastien de Castell just became one of my favorite author, right along with legends of this genre. Another solid romp with Kellen and friends. I liked this a good deal more thanShadowblack - perhaps because Kellen was so distracted by matters in hand he had no time to be distracted by his hormones; perhaps for the return of key characters to make his life hell; perhaps for its emotional focus on friendship and family. Expect more mayhem, more wonder and more Argosi. It's been awhile since I needed more pages to a book. I didn't realize I had come to the last page...I need book 4 now. Again a solid 5-star read. Halfway through I wasn't completely sure about it, but then it got SO. GOOD. And intense. But mostly fricking good. Is it October yet? "Let the meanderings of other lives pass you by, kid"
Charmcaster is the third book in the Spellslinger series. I thought it was an improvement on Shadowblack, but not as good as Spellslinger. Like Shadowblack, Charmcaster has an episodic feel to it which was fun, and I loved the slow development of Kellen's character and the introduction of more Argosi. Kellen, Reichis, and Ferius Parfax are travers "Let the meanderings of other lives pass you by, kid"
Kellen, Reichis, and Ferius Parfax are traversing the desert to Gitabria. Kellen has been tracking down those infected by the onyx worms and practicing his mage skills. This comes in handy when things inevitably go wrong for their little group. They're injured, they're being hunted by religious fanatics and those seeking a reward for Kellen's murder, and there's a new discordance card in the mix. At an Argosi resting house, Ferius is given a card with a small silver mechanical bird on it. This card leads our little group, joined by a surprising figure from Kellen's homeland, Nephenia, to the heart of Gitabria. We encounter a new country, a new city, and a new culture alongside new characters, extra wit, and a complicated intricate stand alone plot that weaves into Kellen's hunt for victims of the worms. As in Spellslinger, I loved Ferius Parfax most of all. She's witty, she's strong, she's dynamic, and her character always has little surprises. Ferius is also the focus point for most of the moral dilemmas in the book: how should we interact with people who live differently to us? What is our duty? Where should we go and who should we serve? What does it mean to be Argosi? These questions are all spinning in Kellen's head as he tries to figure out his journey: he's young and naive, but he's also growing older and more experienced and it's delightful to read. Charmcaster has humour, moral complexity, and plot twists. It's definitely a stronger novel than Shadowblack, but I didn't find it quite as engaging as Spellslinger as there isn't much going on in terms of overarching plot. Reichis is definitely still a strong point! This was such a good read.3rd in the series that has had me hooked from the beginning. I know it is primarily for YA readers,but who cares,it is brilliant. Thoroughly entertaining and exhilarating read that keeps you looking for more. I continue enjoying this series. Great characterisation, carefully plotted story-lines, rich imagination -it’s ticking all the right boxes. planned 6 book series. The covers of all three hardcover books in the series are fantastic! I know I keep saying it but there are times when I pick a book solely based on the cover. This would easily be one of those times. I do not think I could walk past this in a UK bookstore and have it not catch my eye. so it is extremely easy to picture you are right there along with our main character. are quite a few appearances that shock the reader. There was one character hidden behind a mask that I was able to guess the identities of all other new characters were mostly shocking. You never know who is going to show up at certain times in this series. as he tries to find his place in the world. Walking around with a magical warrant hanging over your head is hard to imagine. You have to constantly be ready to fight for your life every second of every day. Kellen has had to make one tough decision after another. It has truly been a joy watching him continue to grow. This book was full of surprises. Each reveal seemed bigger than the next. The fast-paced action never seems to stop. It almost felt like each chapter contained extremely difficult, life changing decisions that needed to be made. Ferrius continues to be a guiding light for Kellen. Watching their relationship grow to be more than just teacher/student/friend has been a pleasure as well. I love this series so much, the way it's written just sounds like a person who loves and enjoys writing! This one was a real rollercoaster too! I can't wait for the next one and I will always recommend this series to everyone! Charmcaster by Sebastien de Castell is the third book in his Spellslinger series of young adult fantasy novels. As such, this review will likely contain spoilers for the previous two books, Spellslinger, and Shadowblack. As with these, Charmcaster follows Kellen, a Jan’Tep spellslinger, cast out by his people, with a price on his head. It is narrated in first person, entirely from his perspective. As such, we get to learn how he sees the world, himself, and the people he cares about. Charmcaster Charmcaster by Sebastien de Castell is the third book in his Spellslinger series of young adult fantasy novels. As such, this review will likely contain spoilers for the previous two books, Spellslinger, and Shadowblack. As with these, Charmcaster follows Kellen, a Jan’Tep spellslinger, cast out by his people, with a price on his head. It is narrated in first person, entirely from his perspective. As such, we get to learn how he sees the world, himself, and the people he cares about. Charmcaster begins approximately six months after Shadowblack concluded. Kellen is seventeen now, a traitor to his people, and has been on the run for a year. He has spent the last six months, along with Ferius, the wise yet impulsive Argosi wanderer, and Reichis, the foul-mouthed and sticky-pawed squirrel cat, tracking down all those made victims of the onyx worms in the previous novel, and attempting to help them. Only one remains on his list. It is this, as well as the desires of a familiar ally, and the concerning discordance card slipped to Ferius, that brings the group to Gitabria, a nation of inventors and explorers. Here, Kellen once again learns that there are always secrets and betrayals to uncover, and even a peace-loving people can be dangerous. Kellen’s purpose becomes even more complicated, as he is forced to once again question who and what he is, and where his path with take him. This notion of paths, and of a person’s place in the world, is brought up a great deal throughout the story, and is an engaging theme, as it is one that everyone, at some point (or multiple points) in their lives, ponders. Charmcaster is an excellent entry into the series. I feel that it is on par with, or maybe even better than, Spellslinger. The plot is strong, and the character dynamics realistic and multifaceted. In Charmcaster, Kellen, Ferius, and Reichis are all more familiar with each other, and how they work separately and together, which is enjoyable to witness, and the reason I think I enjoyed it slightly more than Spellslinger. On the subject of characters, I am happy to see some of Ferius’s backstory coming to light, and I am hopeful that we will get to see more of this in the future (Ferius is my favourite, so I can’t help but feel a little biased toward her). I also believe that Charmcaster was a more solid entry than Shadowblack for these reasons. We learned more about the world in this novel, discovering it alongside Kellen, as we are inside his head the whole time. He is quite naïve and new to the world, especially compared to his mentor, Ferius. The book would be a very different experience if we were to follow along with her, and as much as she is my favourite, I feel like this series benefits from Kellen’s naivety and inexperience; I feel like we get to grow alongside him. Sometimes, being that I’m older and hopefully wiser than him, I did come to accurate conclusions about several reveals before Kellen did. I don’t feel that was a problem however, and rather than feeling frustrated that I was correct in my conclusions, I felt a certain amount of satisfaction. I will definitely be continuing this series (in fact, I am anxiously awaiting the next entry… as soon as any announcements are made, I will be preordering it for my Kindle). I have also moved the first novel in de Castell’s adult fantasy series, Greatcoats, into my ‘needs-to-sort-out-her-priorities’ shelf (essentially, the shelf of books I want to read in the immediate future). His writing style, engaging and infused with humour (though perhaps the Greatcoats will have a different tone- I’m sure I’ll still love it), suits me perfectly. His character dialogue is natural and believable, and his world building is sprinkled in without feeling overwhelming yet is still present enough for me to have a grasp on the surroundings of the characters. Unrelated to the book itself, I love the way de Castell set up his acknowledgements at the end of Charmcaster. It was interesting to read through some of the development of the novel, and heartwarming to see how much he appreciates all the people involved. I am good at separating the artist from the art, but in this case, I will gladly keep them together. If you are a fan of young adult, fantasy, and magic, then I would absolutely recommend this book, and this series. If you aren’t a fan of first person perspectives, or younger narrators, then you may find it irksome, but I would still recommend giving a sample a read or borrowing it from a library. You never know if it will be the exception to the rule. I shall manage to make a review short! I shall! Kellen is still running from his country and the price on his head. He meets an old friend. He goes with Ferius to a new country. They are still following the lead from the bad guys in the previous books. More books are coming and to be honest, I want to know about the shadowblack! Is he gonna go bad? I wish we would get more about that. Still they are light, amusing and short. Win win. I LOVED this book!!!! I have been really enjoying this series and it just keeps getting better! I was crying at at least 3 different parts of the story. Just BAM Out of nowhere I had all the feels! Honestly just great! I can't wait for the next one! The author's writing does not stumble; from the opening to its conclusion, this is a rollickingly good read. At the end of each book, the reader is left wanting more. There are twists and turns galore; the only one that was obvious was the identity of the red mage, but I can live with one slip. The writing style remains very tight with a highly structured plot that migrates seamlessly from one event to the next. The strong characterization is at the core of the writing, what becomes noticeable i The author's writing does not stumble; from the opening to its conclusion, this is a rollickingly good read. At the end of each book, the reader is left wanting more. There are twists and turns galore; the only one that was obvious was the identity of the red mage, but I can live with one slip. The writing style remains very tight with a highly structured plot that migrates seamlessly from one event to the next. The strong characterization is at the core of the writing, what becomes noticeable is that within every relationship there is always tension or something that repels. There seems to be no point at which anything becomes comfortable and sedate. This is obviously great from a plot point of view as there is always the opportunity for some action or word to move the story forward. The downside is that it is a frenetic pace and if it wasn't for the excellent storytelling there would come a point where credibility becomes strained. There is nothing extraordinary about the world building but what there is is rich and fits well with the storyline. **4.4/5 Stars** Another very good addition to this series!! 2) The physical books are simply a great overall experience: to look at, to feel, as well as to read through - the text back/fore edge is the same colour as the front cover, i.e. orange!!! I mean how many books have that? Nevertheless, I couldn’t bring myself to give this book 5 stars, it’s a very very solid 4 stars, **4.4/5 Stars** Another very good addition to this series!! Overall, I still liked the book a lot, and taking only a few days to read it is definitely a good sign that it’s actually pretty darn good. I’m conflicted if I should read Book 4, since it’s not yet available in the format I want it in, but it’ll be a hard decision not to go on for more in this series… Honestly, can’t wait for all 6 books of the series to be available, and this should be already by 2019!! Fajn, tohle byla zatím nejlepší kniha v sérii. Konečně se to pořádně rozjíždí, v sázce je víc, než kdy předtím, a z toho Kellena ještě vyroste něco hodně zajímavého. Kellen, Ferius a Reichis se tedy společně s Nephe Fajn, tohle byla zatím nejlepší kniha v sérii. Kellen, Ferius a Reichis se tedy společně s Nephenií vydají na výstavu, kde se prezentují a prodávají všelijaké zajímavé vynálezy - a nejslavnější vynálezkyně zde představí mechanického ptáčka, který má potenciál uvrhnout celý kontinent do války. Což se na první pohled zdá dost pochybné, ale kdy z dávání života neživým věcem vzešlo něco dobrého? Takže zase velký průser, nikomu se nedá věřit, motají se do toho Jan'Tepové, protože mágové vám prostě nikdy nedají pokoj, a je na Kellenovi a spol., aby to nějak vyřešili. Už mě pomalu začínalo nudit, jak o Ferius nic nevíme. Naštěstí v této knize konečně nějaké to odhalení přišlo a já si k ní konečně začínám budovat nějaký ten vztah. A Reichis konečně získal nějaké ty povahové vlastnosti mimo "sežeru tvoje oči". A mají se s Kellenem rádi a je to hezký. A Kellen! Ten chlapec dospívá, uvědomuje si, že se pořád nemůže schovávat Ferius za zády, učí se dělat těžká rozhodnutí a pak s nimi žít. I was a contraptioneer now, and I'd invented a murderer. Jak se mi po Shadowblacku do této knihy skoro ani nechtělo, teď bych po pokračování sáhla klidně hned, ale bohužel jsem socka a to vydání Soulbindera za dvě stovky vychází až za 173 dní. I've said it before in my reviews and I'll say it again, I read for enjoyment. When I pick up a book primarily I want to be entertained. And DAMN are these books entertaining. Fast paced and action packed with great characters and humour sprinkled throughout. I've enjoyed each one. BUT in this third book did I really feel the emotions, maybe through spending more and more time with the characters maybe I'm stone hearted and it's taken this long to break through my defences. I'm just glad it happened. Any issues I have with this book are nit picks and don't detract from the book in any major way. Thank you to Netgalley, Sebastien De Castell and Bonnie Zaffre for my arc of Charmcaster. Oh how happy I am to be back in the world of Kellen, Ferius and Reichis! I stumbled upon this series last year when the first book Spellslinger was on offer in Asda. I've been hooked ever since. I'm so glad Charmcaster ended the way it does as it guarantees there will be another book in this series and I can't wait! Plus the covers look beautiful so even though I read the 2nd Thank you to Netgalley, Sebastien De Castell and Bonnie Zaffre for my arc of Charmcaster. Oh how happy I am to be back in the world of Kellen, Ferius and Reichis! I stumbled upon this series last year when the first book Spellslinger was on offer in Asda. I've been hooked ever since. I'm so glad Charmcaster ended the way it does as it guarantees there will be another book in this series and I can't wait! Plus the covers look beautiful so even though I read the 2nd and 3rd as arcs I'll still be buying them for my shelves and a reread. Kellen, Ferius and Reichis are being tracked across the desert by a mysterious mage. But when things take a turn for the worst and the mage is kidnapped by religious nuts, Ferius decides they need to go on a rescue mission. What they find changes the path of their destinies once again. Heading out to the city of inventors, the gang including its two new members are on the hunt for a mechanical bird which has shown up as a discordance in the Argosi's cards. Charmcaster was just as fast paced as the first two novels which I absolutely love. There's nothing like a book you can't stop reading and can't put down. All of the characters in this series are so great and I love the banter between them, particularly where Reichis is concerned! It was also great to learn a little more about the different cultures within the world the characters inhabit. There's still a lot of interesting world building to get through and each novel gives you a taster of the secrets the Jan'Tep in particular are hiding. I can't wait to see what happens with next with Kellen and the rest of the gang, and if you've not read this series yet, what are you waiting for??? Sebastien de Castell had just finished a degree i Hi Folks!